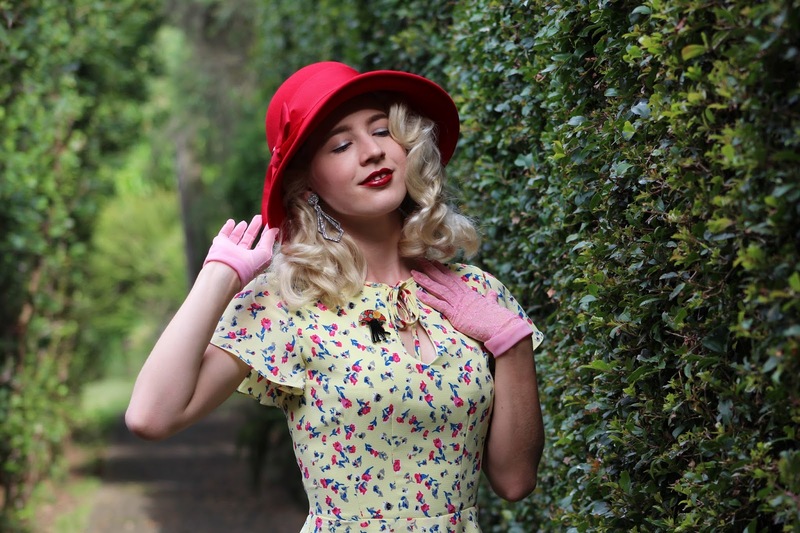 GracefullyVintage: A little bit of this, a little bit of that! This is one of my most favourite outfits, I love the way everything came together - it was one of those outfits where you put quite a few things on at once and I think it works well! 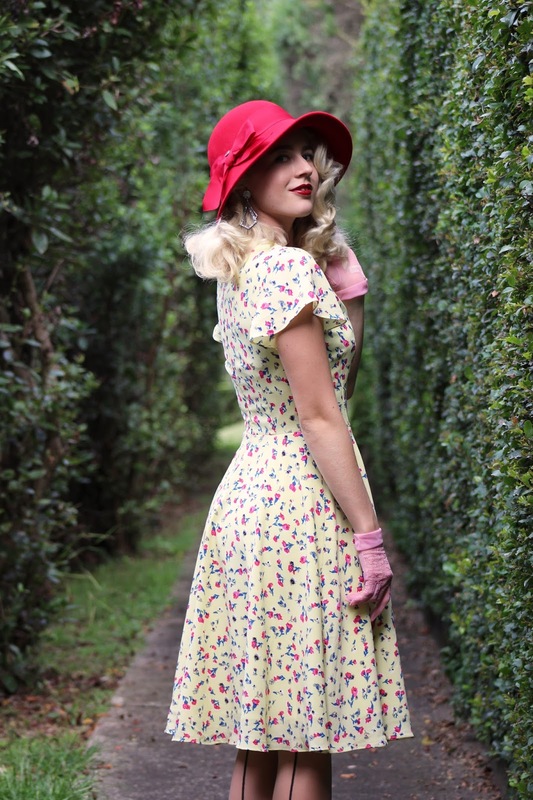 When I chose this Unique Vintage dress and hat I didn't initially plan to wear them together, however when I put the hat on I fell in love with this pairing. This is me pushing for Autumn outfits... But don't hold your breath, there are still some summer looks to come. All the greenery looks so lush after a few days of rain and I was happy to put on my trench coat, though this particular afternoon brought out some beautiful sun. It was also nice to wear stockings again, it seriously feels like forever since I have worn them! I have a soft spot for vintage gloves and am a self confessed glove hoarder, I must remember to wear them more with my outfits as I start to feel more of a chill. These pink sheer gloves are just so lovely, I thrifted them for $3 a couple of years ago and am always on a quest to find more sheer gloves (I have a few now). These earrings by Revere Foile are absolutely amazing (which may I add are made here in Australia). They are dramatic and sparkly which makes me feel really happy when wearing them, I just love them so much. I have a few more styles from this brand which you may have seen on my Instagram. I also love a good swishy dress, this one is fully lined, has gorgeous flutter sleeves and a lovely keyhole neckline. There must also be a special mention for this gorgeous Erstwilder brooch, I love the new Silhouette releases and this particular one is just so sweet. Now back to the dress! I'm not sure if people still claim that blondes can't wear yellow, but I am all for wearing yellow and hey you can wear whatever we want! I love yellow and think it looks absolutely fine on blondes - combined with a floral print I would say this is one dreamy yellow dress and I don't see it clashing with my hair colour. I don't like to miss out on wearing certain silhouettes and colours so I say give it a go if you are in doubt about something! I always regret my hastily put together looks, they always seem to look weird, but you have the knack down! Great look! Gorgeous outfit! The colours here just pop off the screen and look utterly radiant on you, sweet gal. I say down with so-called fashion rules regarding colours. You amply demonstrate that blondes can, and should, wear yellow. Anyone who says blondes can't wear yellow just hasn't seen the right blonde wearing the right shade. This looks absolutely smashing on you! As do most things, but that's beside the point. The ditsy floral print is so cute, and I think this is a perfect transitional as we move into a new season (spring or fall). Love the dress, the colour is so sweet, and those earings are perfect!